Dr. P.K.S. 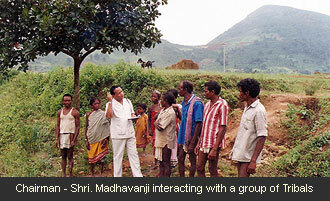 Madhavan came to Hyderabad in 1975 with the intention of writing a book on Chenchu Tribes (one of the primitive tribes of India), but after seeing the appalling conditions of Chenchu tribes in Amarabad plateau of Mahaboobnagar district, he decided not to write a book for his academic excellence, but stayed on with the tribals for their upliftment. He realized that mere money and material would not develop the poor, rather it makes them weak, dependable and meek. Therefore, he realized that awareness is a pre-condition for development. Dr. Madhavan was highly inspired by Gandhiji. He has realized the vision of Mahatma Gandhi in every aspects of development. He often stated how Gandhiji was misunderstood and his followers misinterpreted him. 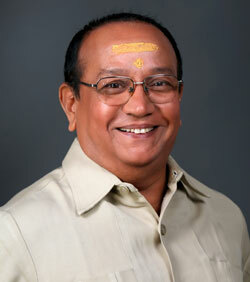 Dr. P.K.S. Madhavan says “it is the basic need to awaken the people and to prepare them to identify their own problems and to prepare them to devise their own solutions and plan of action. The oppressed must not only recognize that they are oppressed but must also be aware of what they can do, legally, peacefully, and constitutionally, to overcome their oppression”. This thought has given birth to AWARE in the year 1975. AWARE was started with three villages has made its presence in 8,760 villages in the States of Andhra Pradesh, Orissa, Maharashtra, Gujarat, Uttar Pradesh, Uttaranchal, Kerala, Karnataka and Tamil Nadu making AWARE largest internationally reputed National Development Organization in India. AWARE made more than 3,000 villages self reliant and helped 2.5 million families to cross above poverty line. Majority of people in these villages gave up consuming liquor. AWARE has since achieved spectacular results making people to stand on their own legs with dignity and equality.